WEST LAFAYETTE, Ind. 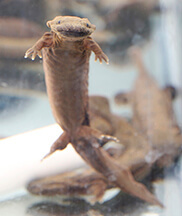 - Purdue University is partnering with three Indiana zoos and the state in a conservation program that will involve raising year-old hellbender salamanders and then a few years later returning them to their southern Indiana habitat to be tracked. 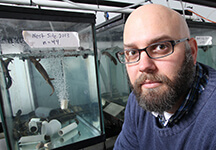 Rod Williams, associate professor of wildlife science and leader of the university's hellbender effort, approached officials at Columbian Park Zoo in Lafayette, Fort Wayne Children's Zoo and Mesker Park Zoo in Evansville about joining the program, which also includes the Indiana Department of Natural Resources. North America's largest salamander is in decline nationally and is most vulnerable to predators when young. "Mortality can be as high as 99 percent in the wild," Williams said. "By rearing them in captivity for three to four years they will have a much better survival rate." In 2013, Williams and his team collected 300 eggs from the Blue River in southern Indiana, currently the only location in the state where the salamander is found. 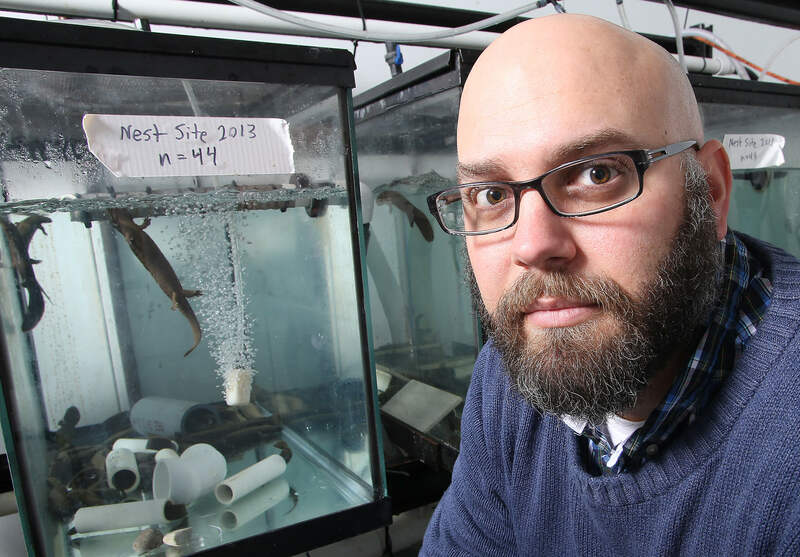 "You don't want to have all your eggs in one basket - literally," Williams said, referring to the 1-year-old hellbenders that were hatched at Purdue's Aquaculture Research Lab. "Parceling some of them out to different locations reduces the risk that an equipment malfunction or other problem could jeopardize the entire clutch of eggs." The Fort Wayne Children's Zoo will receive 20 on Tuesday (Feb. 17). The transfer of another 20 to Mesker Park Zoo and 10 to Columbian Park Zoo will be scheduled soon. The zoos have been preparing since last summer, setting up chillers, water pumps and tanks, replicating conditions at ARL. Last fall, a representative from each zoo and Williams’ team attended a hellbender husbandry conference at the St. Louis Zoo, a world leader in captive rearing of the amphibian. Joe Smith, director of animal health for the Fort Wayne zoo, said the zoo's mission is to inspire people to care about wildlife. "We're always looking for local opportunities, and it's especially important that our guests can take steps to protect hellbenders and their environment," he said. "Knowing that they will be returned to the wild is a big motivator for me," said Smith, a veterinarian. "We don't often get to contribute to conservation so directly. Most of our impact is through education." For Williams, education is an important part of the partnership. The zoos will expand on his Purdue Extension programming and the Help the Hellbender website. "Collectively, the zoos can reach about a million patrons a year," Williams said. "The combination of research, conservation messaging and increased awareness is a win-win for everyone." Key messages include what anglers should do if they catch a hellbender and how homeowners and farmers can improve water quality through conservation practices. While Columbian Park Zoo has worked with Purdue on other projects, this is its first wildlife conservation collaboration with the university, said Dana Rhodes, interim zoo director. "It's a great conservation program and local-state partnership." While the hellbenders will not be incorporated into public exhibits at the zoos, they may be included on special tours, such as those for school groups. Two years ago, Williams and his team released 18 hellbenders, which were raised in captivity, into the Blue River. Radio transmitters tracked their movements and habitat preferences for a year. The results will help guide the future release of those raised by Purdue and the zoos.